This is not a new bladder complaint, but a spate of injuries associated with this year's "must have" Christmas gift. As many children awoke on Christmas morning to find the Nintendo Wii in their stockings, the excitement of this new computer game got the better of many middle aged parents. 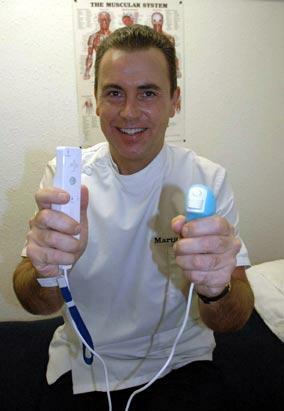 Cheshire Osteopaths Martin Davies & Associates have noticed that many of their patients have recently started to suffer from “Nintendo Wii syndrome”. They have been treating patients with neck, shoulder and tennis/golfers elbow problems brought on as a result of not following the Wii guidelines, which, amongst other things, recommends restricting the length of time that you play on Wii. Some of their older patients in particular are finding their neck, shoulders and elbows are painful and Martin Davies has found that some of them have been playing Wii for up to 10 hours. As Wii should be played standing up (not sitting) to play for several hours is not really to be recommended. People who are not used to exercise in general, particularly if they are stiff after the Christmas excesses, should perhaps think twice about playing computer games at all. Before starting a play session, you should go for a brisk walk, to warm up, and carry out gentle stretching exercises. Help with appropriate stretching exercises can be found on the website www.osteopaths.uk.com. It is surprising how much exercise you can get playing the Nintendo Wii, which makes a pleasant change for the couch potato computer game generation, and must be considered a good thing, as long as you follow the manufacturers guidelines and limit your playing time. To find your local osteopaths for help and advice with neck or shoulder problems, please consult the General Osteopathic Council on 0207 357 6655. A computer game which allows users to play virtual tennis in their living room has been blamed for a spate of injuries dubbed "Nintendo Wii syndrome". The Wii, which allows people to mimic the movements of activities such as golf, bowling or boxing via a hand-held motion sensor, has been identified as the cause of thousands of minor accidents and injuries. Osteopaths say middle-aged parents are most at risk from neck, shoulder and elbow problems brought on from playing for too long. Martin Davies, who runs five osteopathic clinics in Cheshire, noticed a sharp rise in Wii-associated injuries after Christmas. He said: "We noticed we were getting a number of middle-aged parents coming in having played for far too long on the Nintendo Wii that they had bought their children. "The older patients in particular are finding their neck, shoulders and elbows are painful and some said they had been playing Wii for up to 10 hours." Mr Davies says tennis and boxing are the biggest cause of injuries, and he is advising patients to ensure they follow the manufacturers guidelines and limit their playing time. He has also devised a number of warm-up exercises which can be carried out before starting a play session. "But it is not all bad," Mr Davies added, "One parent reported that his son had lost a stone in weight since getting a Wii for his birthday." COMPETITIVE parents are suffering a spate of embarrassing injuries as they take on their children on the Nintendo Wii games console. Doctors say older users are underestimating the effort required to play virtual sports in their living room. An osteopath in Stockport says he has treated 20 patients who have injured themselves since Christmas by playing for too long or too energetically. In many cases it is mums and particularly dads who have bought the game for their children and are overdoing it. The Nintendo Wii requires players with a controller to emulate sports such as boxing or baseball and the on-screen characters follow their movements. One red-faced victim said he started to feel the effects after playing the tennis and bowling games on the Wii for several hours on Boxing Day. `Mike', 45, of Marple, carried on playing the game after his two children went to bed and began to suffer pain in his neck and shoulder the next day. he said: "At first I didn't know what was wrong, but it could only be that. "It felt awkward and horrible. Now we do bits and bats on the Wii, but I do it a bit at a time and I don't carry on for ages." Mike had to make two visits to his osteopath. One osteopath, Martin Davies, said some patients have arrived at his Stockport practice with excruciatingly painful injuries to their neck, shoulders and elbows. And in some cases, he says, they have been in so much pain they have been unable to drive or to go in to work. Some of the patients he has treated admit they have been glued to the console for up to 10 hours without a break - breaking guidelines issued by the company. Mr Davies said: "People who are not used to exercise should think twice. And before playing you should go for a walk to warm up and stretch the muscles. Warming up is definitely necessary because the sort of injuries we are seeing are strains which can be avoided with gentle exercise." A Nintendo spokesman said: "Nintendo is confident that by using the Wii Remote and wrist strap in compliance with the guidelines provided by Nintendo, people will fully enjoy their games without causing injury to themselves, other people or damaging surrounding objects. "Nintendo is continuing a dialogue with players about the proper and safe use of the motion-sensitive Wii Remote controller when playing Wii Sports." In order to avoid injury, Nintendo advises players to wear the wrist strap, to keep a firm grip on the Wii Remote and to make sure people and objects are out of the range of movement before play begins. Parents are suffering the curse of too much Christmas Wii. Pestered parents are getting injuries after spending too long playing the games with their children, it was claimed today. The neck and shoulder strains - dubbed Nintendo Wii syndrome - are being suffered by adults taking part in virtual games of tennis and boxing. The games are played using a Wiimote, a remote control which transmits a player's movements to a screen. At greatest risk are middle-aged parents pestered into "just one more game" with their children, said Martin Davies, an osteopath who runs four clinics in Cheshire. Mr Davies, a practitioner for 23 years, saw 20 new patients in the weeks after Christmas, each the parent of an enthusiastic Wii player. Mr Davies said: "I think there is a link between using a Wii inappropriately and suffering injury. "In the first fortnight after Christmas I saw 20 parents with the same problem. "It is predominantly neck and shoulder strains caused by middle-aged people playing these games for excessive periods. "Over Christmas it's natural for parents to spend lots of time with their children, but some are spending hours and hours playing tennis and boxing. "Parents, as much as the youngsters, have to learn to follow the guidelines." Mr Davies added: "But it isn't all bad news. The son of one of my patients lost a stone in weight by playing the Wii games. "The days of a child sitting in front of a screen and exercising little more than their thumbs may now be over. "The more modern games can be hard work and require lots of energy." Nobody from Nintendo was available to comment. Parents playing too many Nintendo Wii games with their children are risking injury, an osteopath has said. "Nintendo Wii Syndrome", caused by over-enthusiastic use of the Wiimote, can lead to neck and shoulder pain. The number of cases has risen since Christmas as children who received the console pester their parents to play with them, osteopath Martin Davies believes. He said: "I think there is a link between using a Wii inappropriately and suffering injury. "It is predominantly neck and shoulder strains caused by middle-aged people playing these games for excessive periods." However, the Cheshire osteopath said playing active computer games did have some benefits as it could help players lose weight. BEWARE the effects of too much Wii – that’s the warning from a Crewe osteopath who reports the number of patients with injuries induced by the Nintendo console has soared. Dr Martin Davies, of Martin Davies & Associates in Valley Road, says he is seeing a large number of injuries that have arisen from excessive gameplay, and has dubbed it ‘Nintendo Wii Syndrome’. Dr Davies, who owns a console himself, says some of his patients have been playing for up to 10 hours at a time. As many children awoke on Christmas morning to find the Nintendo Wii in their stockings, the excitement of this new computer game got the better of many middle aged parents. Competitive dads are suffering a spate of injuries after spending too long playing computer games with their children. Back experts say unfit adults are under-estimating the physical effort needed to play the Nintendo Wii and similar consoles in their living rooms. Some of the worst muscle and neck pains - dubbed Wii Strain - are being picked up by fathers determined to beat their children at virtual boxing and tennis. The Wii, Christmas's must-have games console, has proved a massive hit among families. Unlike traditional games machines, which use a thumb-controlled joypad, the Wii is played by waving a wireless, motion-sensitive box through the air to control the movement of bats, racquets and boxers. 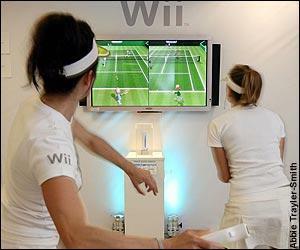 When the console was launched in 2006, doctors reported a flurry of patients complaining of Wii Strain. Now, after huge Christmas sales, those injuries are back. According to Martin Davies, an osteopath in Cheshire, middle-aged parents pestered into playing "just one more game" with their children are at the greatest risk. Mr Davies saw 20 new patients in the weeks after Christmas, each the parent of an enthusiastic Wii player. He said: "I think there is a link between using a Wii inappropriately and suffering injury. "In the first fortnight after Christmas I saw 20 parents, predominantly with neck and shoulder strains. In some cases, patients have been in so much pain they have been unable to drive or to go to work. "New players often overestimate how high they need to swing and wave their arms to control the games. Usually, just small movements are enough to send a virtual tennis ball flying over a net." The consoles can also be addictive - leading some to play for hours at a time without taking a break. "The days of a child sitting in front of a screen and exercising little more than their thumbs may now be over. The more modern games can be hard work and require lots of energy." He recommends players warm up before starting a Wii session. Strains are not the only risk for players. Some addicts have reported black eyes and bruises after getting too close to an enthusiastic player. A Nintendo spokesman said: "Nintendo is confident that by using the Wii remote and wrist strap in compliance with the guidelines provided, people will fully enjoy our games. PARENTS are suffering injuries from spending too long playing active sports video games with their children, health experts have reported. Adults have reported painful neck and shoulder strains after taking part in virtual games such as tennis and boxing with their younger relatives. The phenomenon is known as Nintendo Wii syndrome, or Wii-itis, after the game which proved a massive hit at Christmas. Players mimic the actions involved in the sports while holding a remote control which transmits their movements to a screen. The mishaps caused by the craze have been catalogued on websites such as www.wiihaveaproblem.com while the British Chiropractic Association has devised warm-up exercises to help gamers avoid injury. Martin Davies, an osteopath in Cheshire, said those at greatest risk were middle-aged parents being pestered into "just one more game" by their children. Mr Davies said he had seen 20 new patients in the two weeks after Christmas – each one the parent of an enthusiastic Wii player. He said: "It is predominantly neck and shoulder strains caused by middle-aged people playing these games for excessive periods. "I think there is a link between using a Wii inappropriately and suffering injury. "Over Christmas, it's natural for parents to spend lots of time with their children, but some are spending hours and hours playing tennis and boxing. However, he added: " It isn't all bad news. The son of one of my patients lost a stone in weight by playing the Wii games." Physiotherapists also warned of the dangers of such games, but said playing them was better than more sedentary computer games, or taking no exercise at all. Kirsten Lord, the managing director of the privately-run Edinburgh Physiotherapy Centre, said injuries could be caused by people colliding with walls and furniture because of having insufficient space for the games, or drinking before they played. However, she said Wii games had benefits such as players using their arms and upper body, which helped ward off cardiovascular diseases. Roger Vincent, a spokesman for the Royal Society for the Prevention of Accidents, said people should read the instructions before starting to play such games. Health boards in Edinburgh and Glasgow said they had no indication of a serious problem with such injuries. A spokesman for Nintendo using the Wii remote control and wrist strap in compliance with its guidelines would prevent injuries or damage to surrounding objects. However, he said players should ensure people and objects were out of the range of movement before play began. SPORTS fan "Beth Thomson" was determined not to let her young nephew and niece beat her at virtual boxing – to her cost. Beth, 36, thought she had slept on her arm when she work up in pain the morning after playing the Wii game with her eight- and nine-year-old relatives for three and a half hours. The researcher, who asked for her name to be changed to save her blushes, went to work with an aching right wrist and forearm which became much worse. Beth only realised the cause later when she mentioned the injury to her sister – the children's mother. Both parents had suffered similarly since their son received the game for Christmas. Beth, from Cambuslang, near Glasgow, said: "I was being beaten by an eight-year-old and was not having it, so I kept playing and went a bit far. "It's put me off computer games for life – I'll stick to my niece's karaoke game next time."